I found this on Indecisive Peach (she shows Demon Kitty, too, so click on over there) quite a while ago and tossed it into my "Things to Blog" folder. Well, I'm just now getting back to it, so here it is. 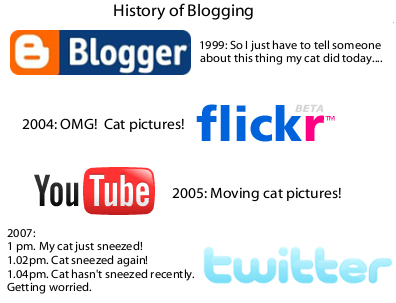 The history of blogging, all summed up into one image. Pretty cool, huh? Hehe. I wandered over here to put a random comment about how I tagged you with a meme and then find that you linked to me and my Demon Kitty. Perhaps I'm being uncourteous in my blogging ethics not knowing if you like those sort of things (but these always make me feel all "with it" in bloggerdom) but at any rate, you can keep the meme in your queue just in case there is a slow news day during NaBloPoMo. Haaaaa. I love this. I have very deliberately refrained from posting cat-related content of any kind, but only time will tell. Thanks for stopping by BeanPaste: Cat-Free Since Early 2007.